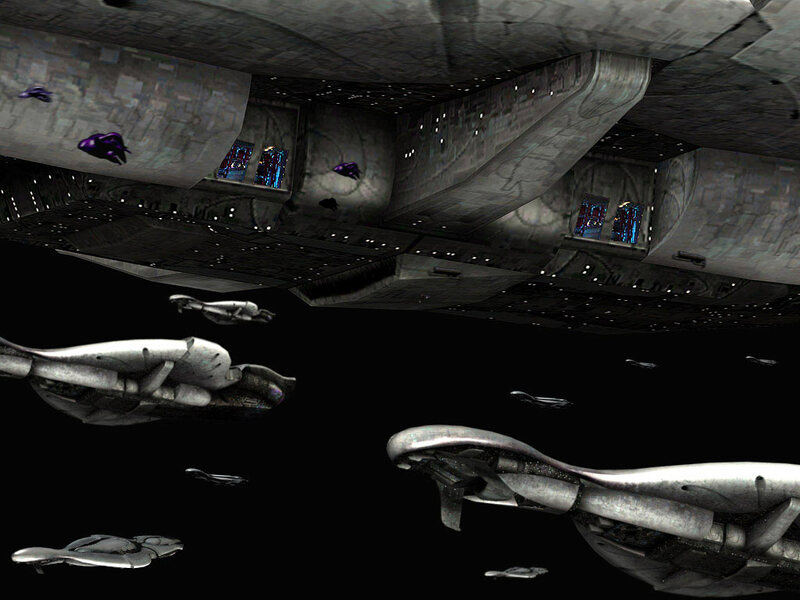 The Covenant CCS-class cruiser is one of the most recognizable ships in the Covenant fleet and, at nearly 2km in length, one of the largest. 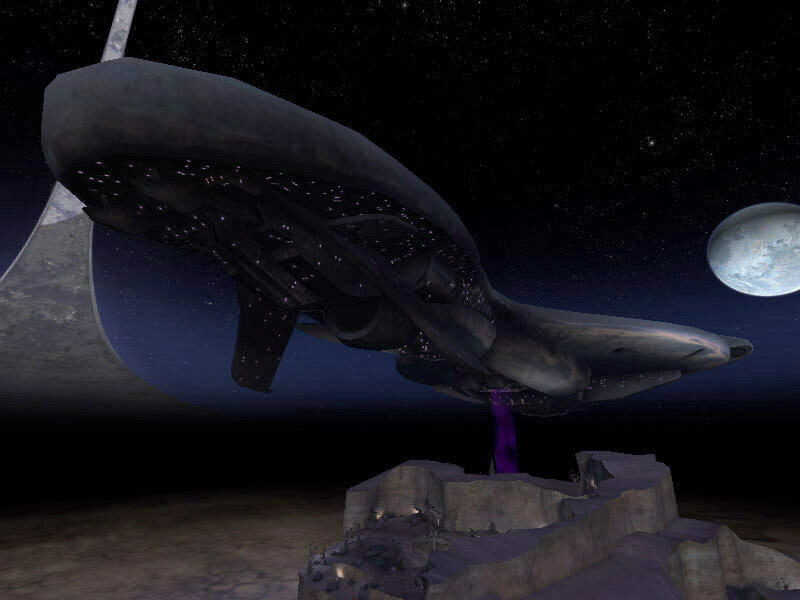 This classification of space vessel has been one of the most often encountered by UNSC forces since the beginning of the war with the Covenant. 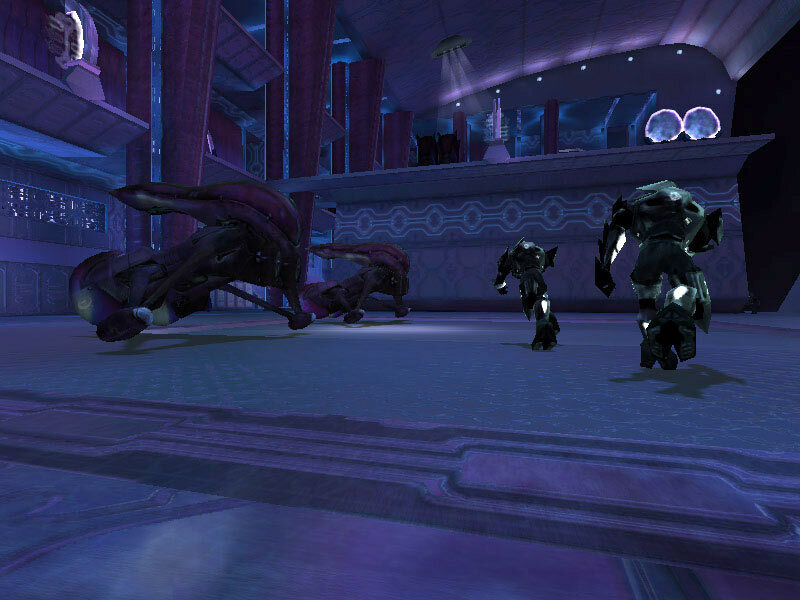 Very little is known of its vast interior; however, a rescue team consisting of a Spartan-II with an onboard AI and several Marines successfully infiltrated a Covenant cruiser on September 19, 2552. 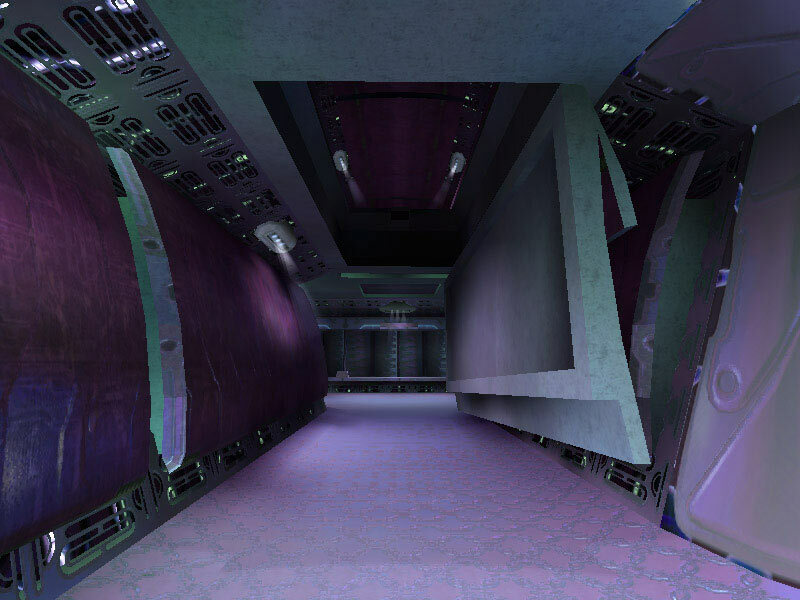 Scans of the interior of the vessel by the UNSC personnel with their various scanning and recording devices have yielded a partial layout of one of the Covenant's cruisers, vessel DE H c-1: the Truth and Reconciliation. Covenant cruisers are armed with both Pulse Laser Turrets as well as Plasma Turrets. Pulse Lasers are very powerful speed-of-light weapons. It is a high intensity laser bolt, radiating energy in the blue wavelength of the spectrum. The turrets themselves are chitinous pods featuring insect-like antennae and are located at various points around the vessel. The Plasma Turrets launch Plasma Torpedoes at roughly half light speed. The torpedo is a lance of plasma contained and guided by a shaped magnetic field. It is a devastating weapon that can severely damage a UNSC ship in only a few hits. 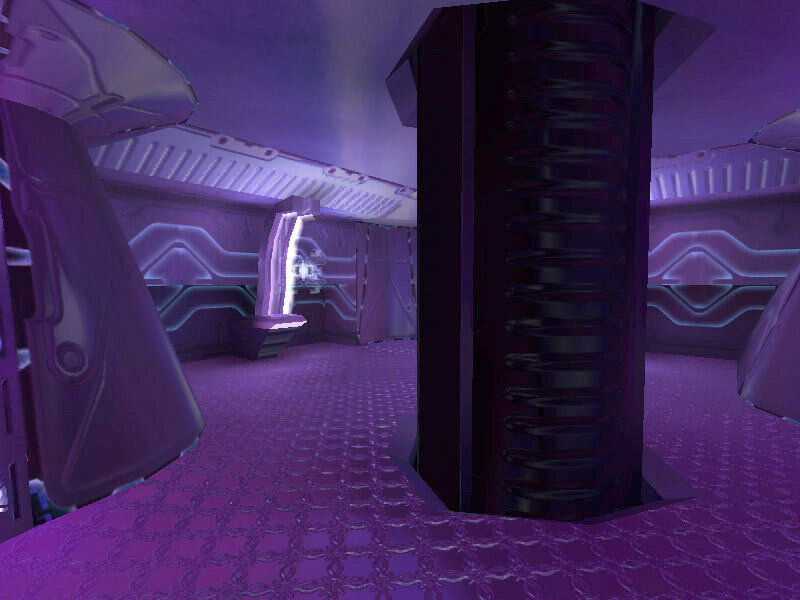 The Plasma Turrets are located along the lateral edge of the ship. Covenant cruisers, like all the capital ships in their fleet, are capable of both sublight and Slipspace propulsion. The upper limit velocity of their sublight speeds is unknown, but is estimated at faster than UNSC ships. Battle cruisers like the Truth and Reconciliation have two large engines at the back of the ship for sublight propulsion. Slipspace generators on board are fine-tuned enough to make a much more efficient and low-power transition to Slipspace than UNSC ships and are therefore faster at traveling in the alternate dimension. 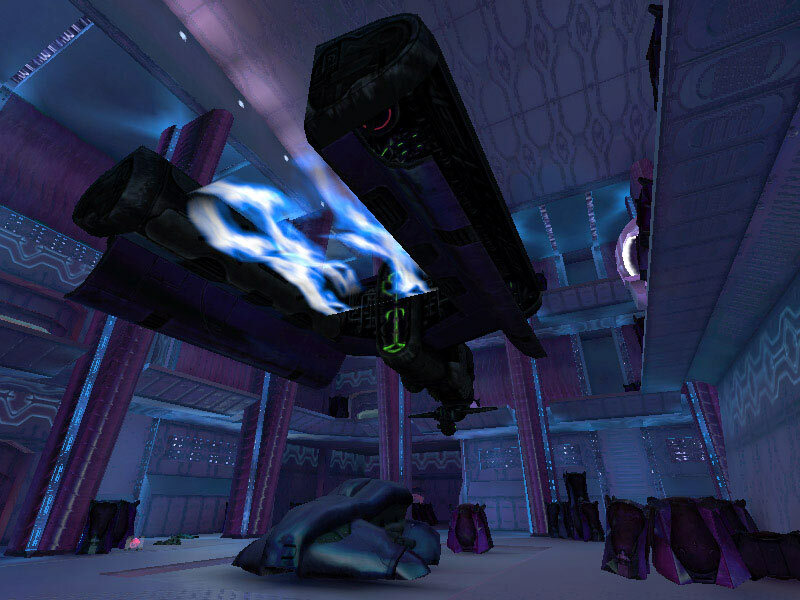 Covenant ships are also capable of greater precision in exiting Slipspace at a given location. Covenant shipboard reactors utilize tritium plasma as a fuel source. 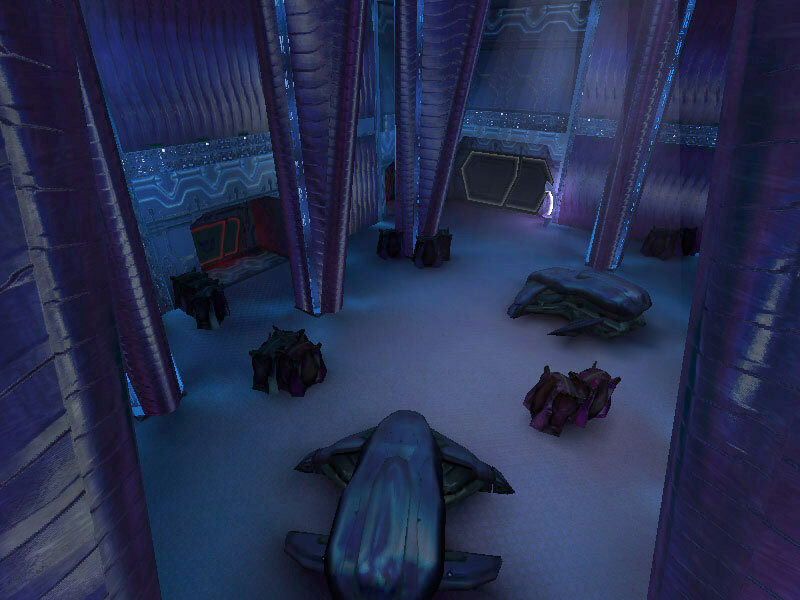 The Covenant had a mine for tritium gas in the Lambda Serpentis system. Not much is currently known about the interior arrangement of most Covenant ships. The best known example is the Truth and Reconciliation, due to the efforts of UNSC infiltrators. Only a few corridors were mapped out, along with visual and telemetric data on the ship's control center, shuttlebay, cargo bays, and brigs. Sensor readings indicated the presence of other shuttlebays and cargo bays, the details of which are speculated to be nearly identical to their known counterparts. 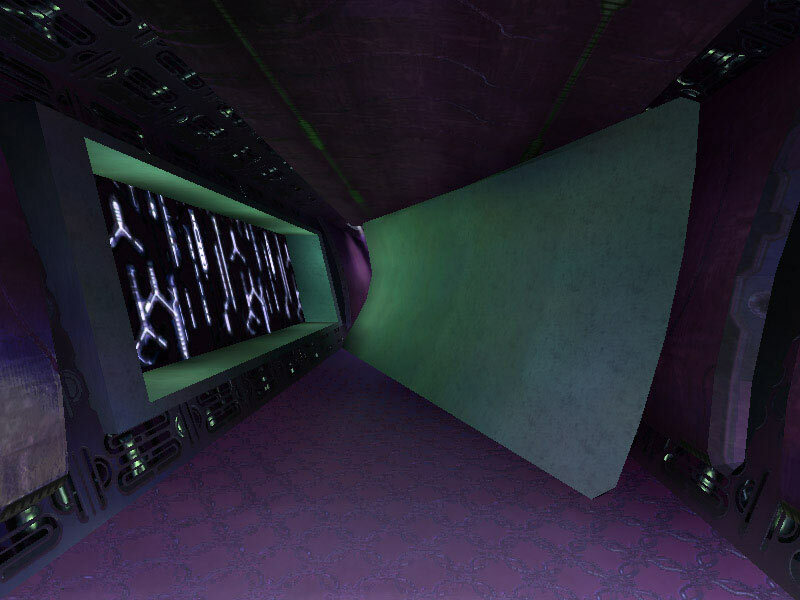 There are hundreds of kilometers of corridors snaking throughout the ship in a seemingly endless maze. A full deck height of about 6m (or 20ft), floor to floor, was measured from an overhead compartment leading to a deck above. This leaves room for circuitry, piping and other conduits, plus ample room for crew passage. Using this deck height, a maximum of 38 decks is possible in the Covenant cruiser. 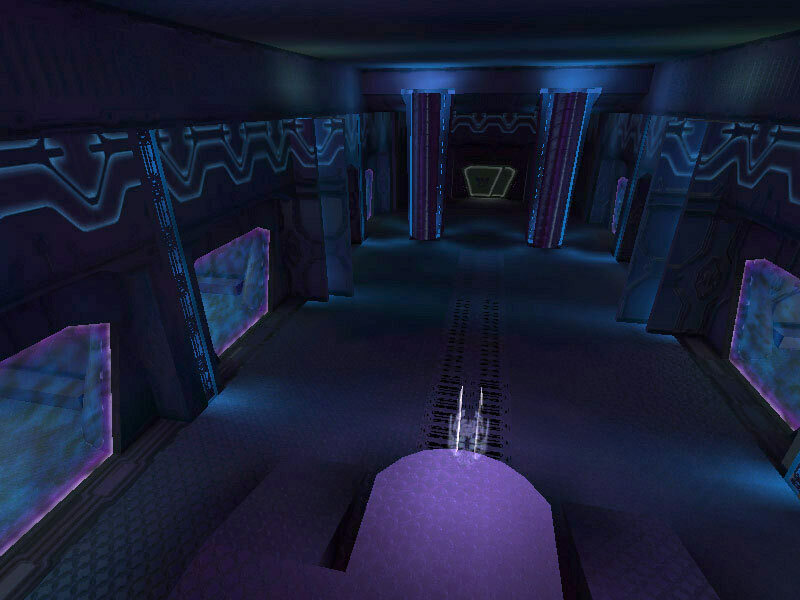 There are several corridor panel types encountered on the cruiser. Some seem decorative and others are decidedly utilitarian. The panel in the Corridor Junction or what is arbitrarily labeled Panel Type #1 seems like it may be a weapons rack or equipment storage area. Panel #2 is access piping for ship's power. The panel labeled Type #3 is often encountered as a backing substrate of many of the corridors. It is a grating which saves on weight without compromising strength. Much of the ship's structure contains this alloy. 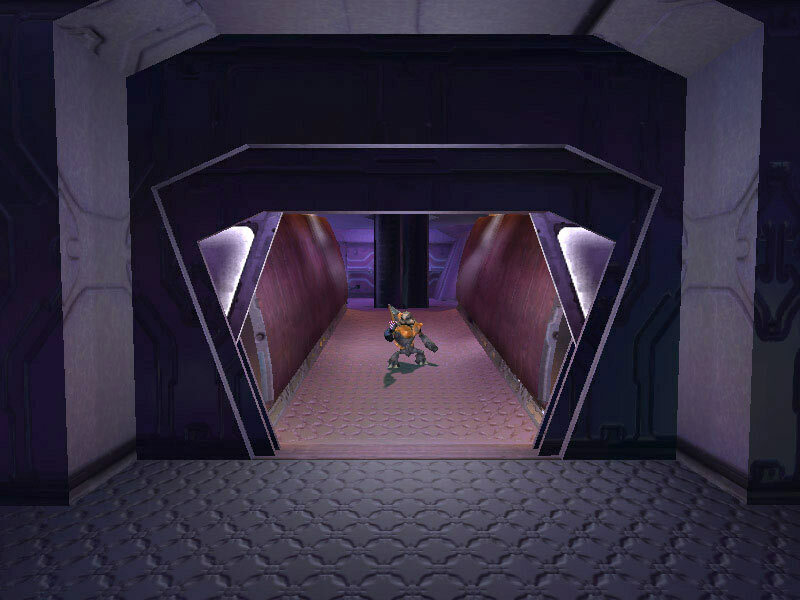 Occasionally it is used as a barrier separating corridors from rooms such as the ship's Control Center, which is seen in the above image beyond the grating. Corridor Panel Type #4 is one of the most common corridor panel designs on board the cruiser. 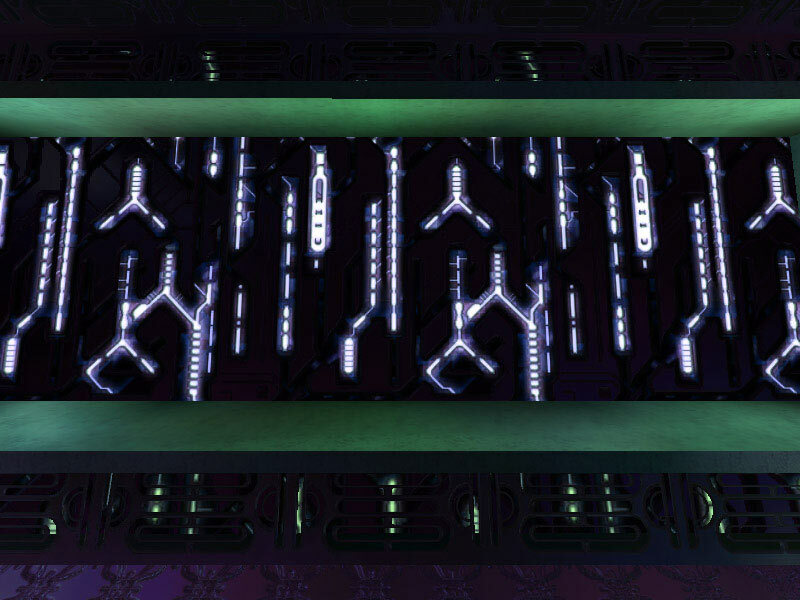 Behind these decorative panels are the ship's circuitry and computer waveguide conduits. 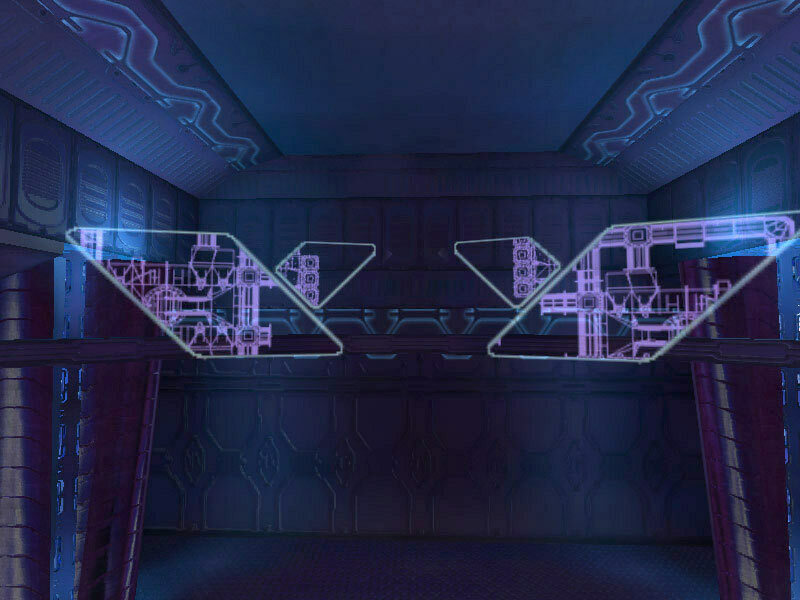 To repair or work with the ship's circuitry, the outer panel may be removed for access. At several locations on board the cruiser, there are corridor junctions where access to the deck above and below is facilitated. 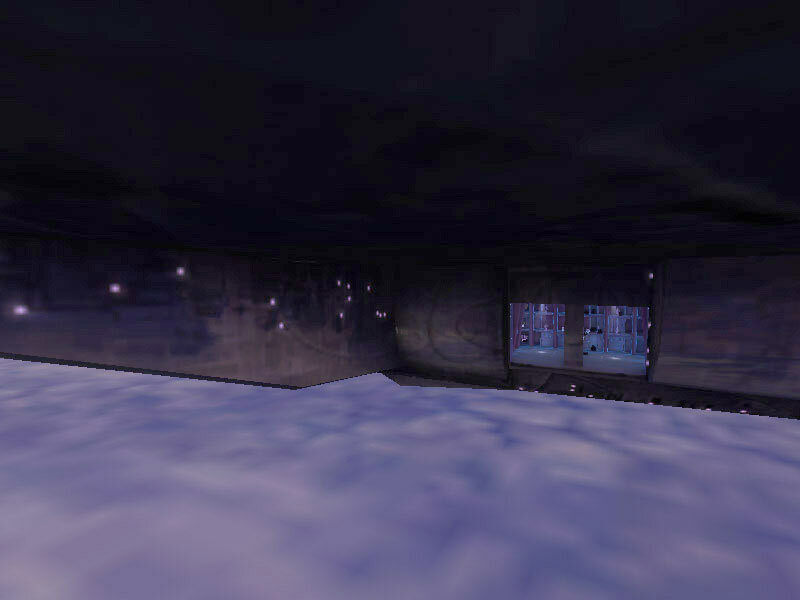 This inter-deck junction is intended more for maintenance than actual crew travel between decks, and is suspected to be there for the use of Covenant Engineers, who can float freely between the decks. At each of these junctions are holographic control panels used to open hatches and extend or retract the inter-deck tubing. Ship's circuitry is also layered within the inter-deck structure, accessed by overhead panels. 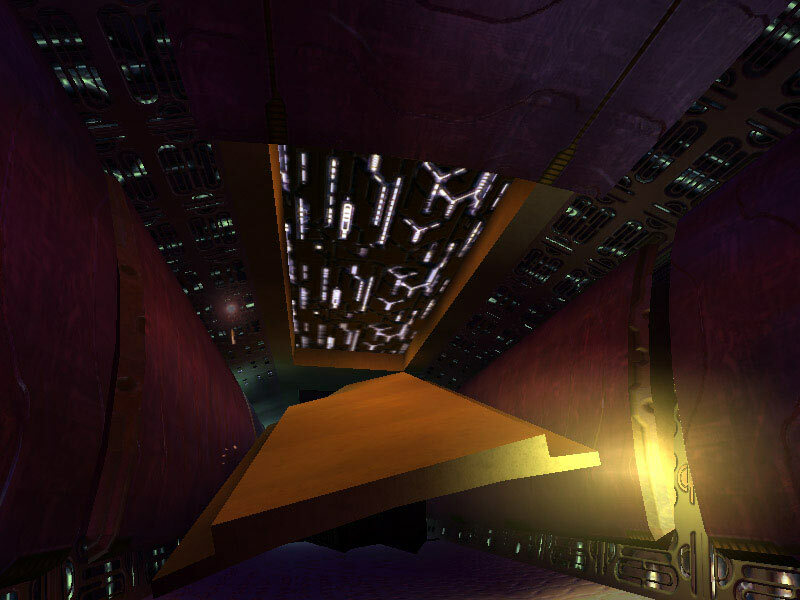 Corridors on the Covenant cruiser are divided by airtight hatches. The hatches are intended to keep hull breaches contained, and to prevent unauthorized access to certain areas. Many of the hatches on the cruiser are proximity activated. Only objects of a certain size can trigger the detectors. 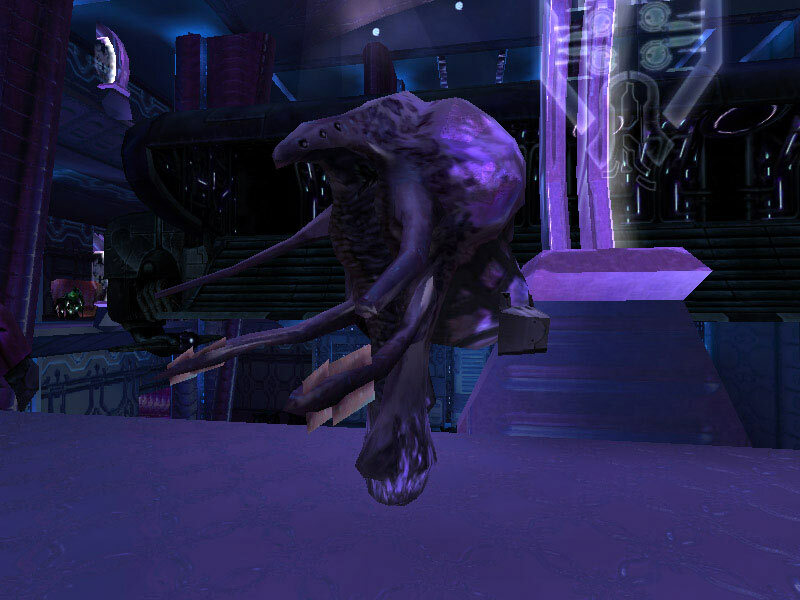 Flood Infection Forms, for example, have been seen to be too small to activate the doorways. Hatches that are locked have an illuminated red trim around them. White light trimmed hatches can be freely accessed. 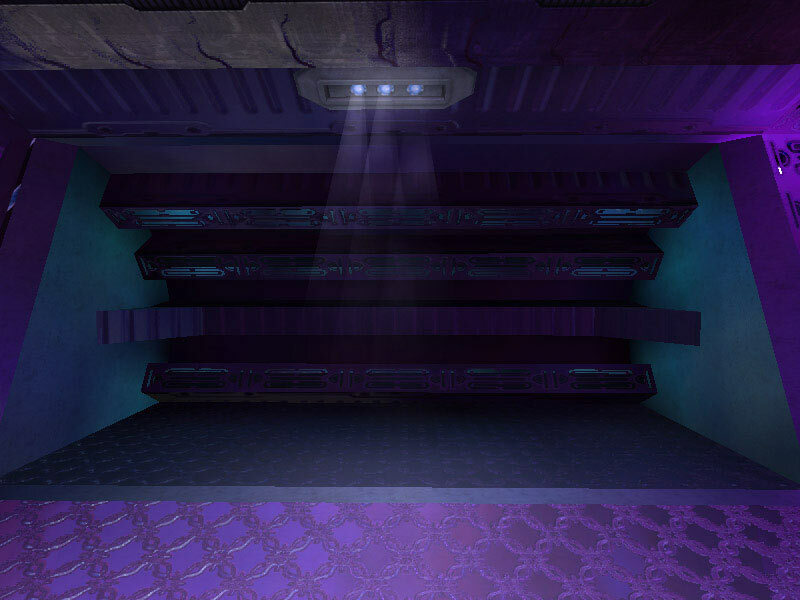 Other, larger doors on the cruiser, such as those found in the cargo bays, are for vehicle transfer between bays and gravity lift rooms, such as Ghosts and Wraiths. 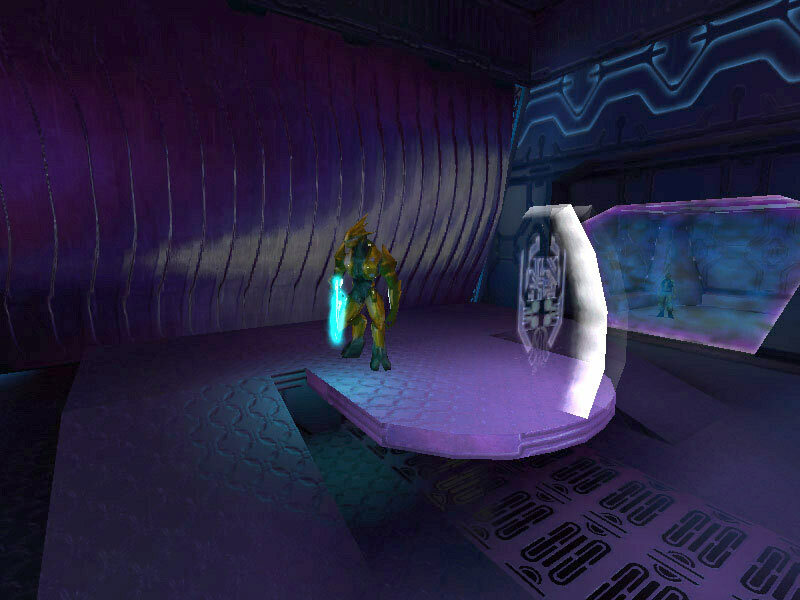 These doors are opened similar to the corridor junctions by nearby holographic controls. 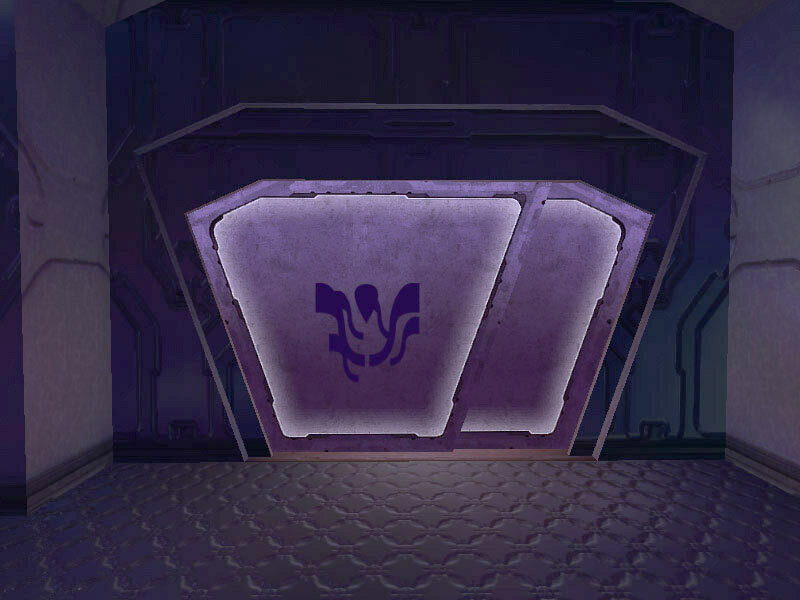 All crew doors are marked with a symbol of sorts though the exact significance of the emblem is unclear. In the UNSC's research, only one emblem has been discovered on all hatches on the Truth and Reconciliation, however, four such colors of that emblem have been found: red, yellow, green, and blue. The symbols may also appear mirrored depending which side of the hatch they appear on. 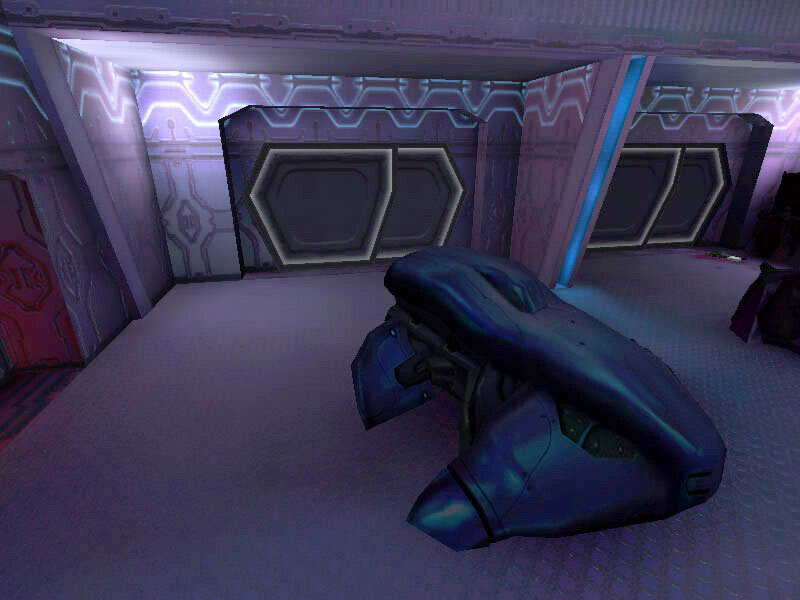 From the UNSC infiltration of the Truth and Reconciliation, blue seems to be the predominant marking color of the decks and hatches encountered. They may signify contents of rooms or deck number or a warning. It is not currently known. 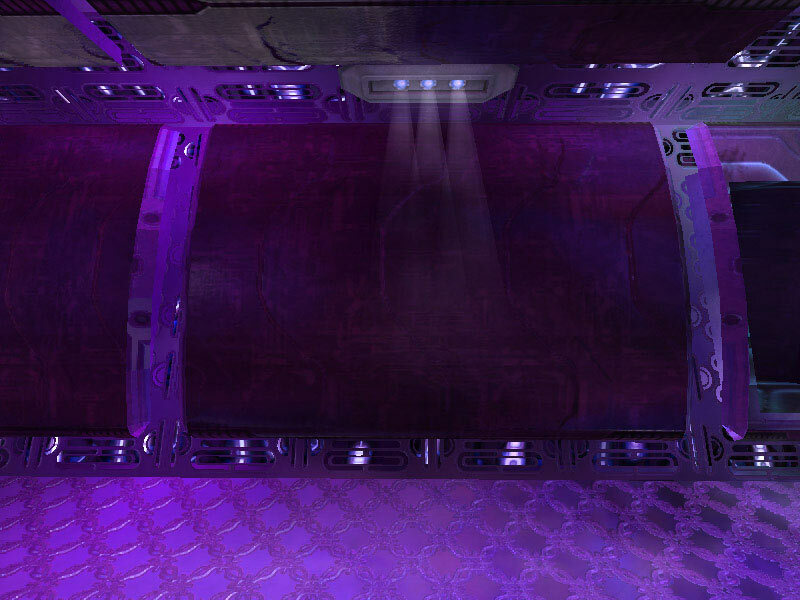 Buried in the heart of the Covenant cruiser, is its control center. This is where the entire ship's operations are coordinated by the Ship Master, a Covenant rank analogous to a UNSC captain. It has only been observed that a Ship Master position is filled by an Elite Zealot in their gold-colored armor. 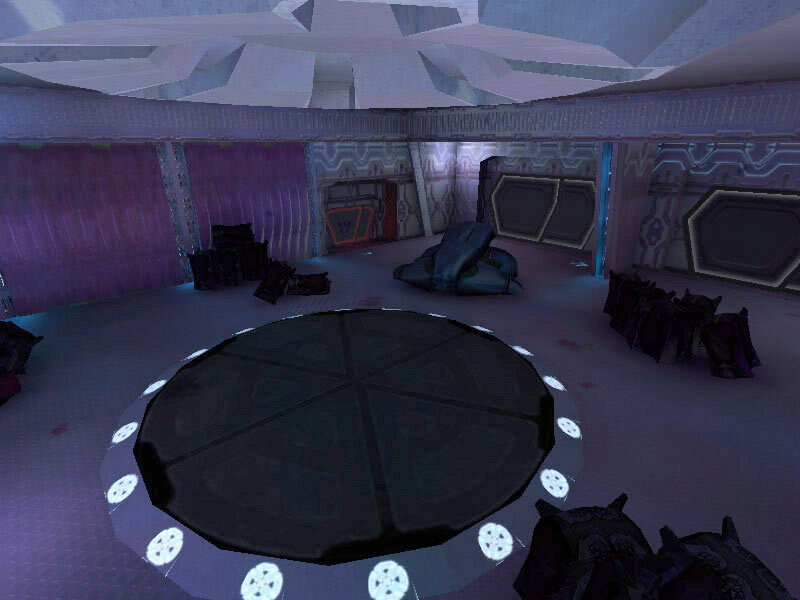 The ship's control center is characterized by a raised circular platform overlooking the rest of the room. 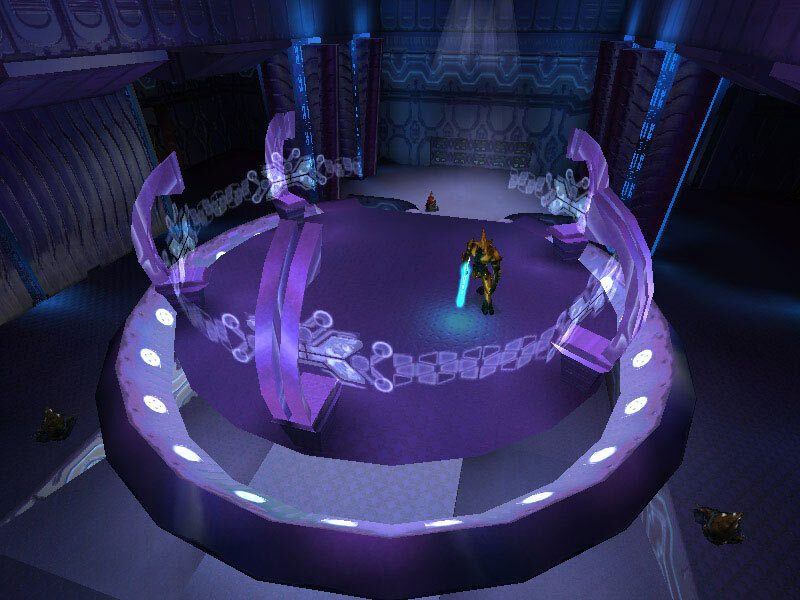 Holographic controls line the outer perimeter of the raised dais. 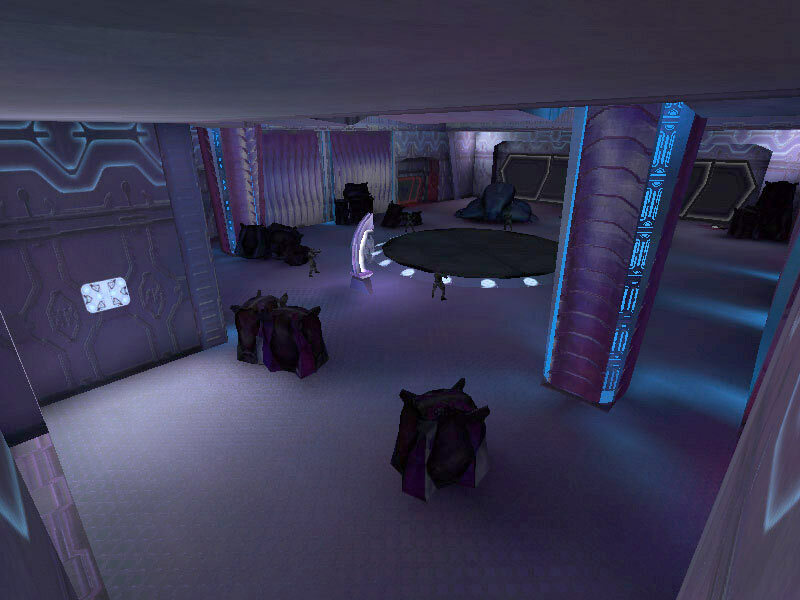 All Covenant shipboard holograms seem to favor the purple-blue end of the EM spectrum. It is assumed this is the favored frequency of visible light of the eyes of Elites; the primary operators of these vessels. 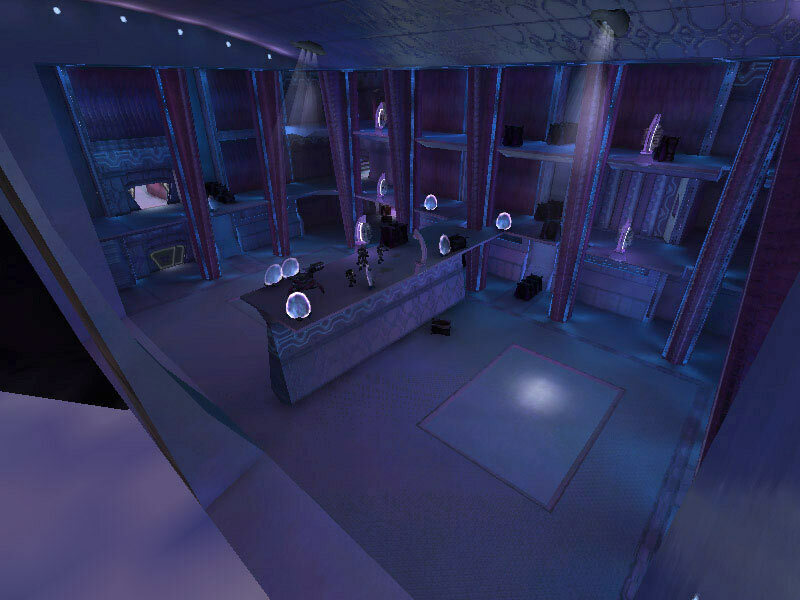 The viewscreens are also holographic projections, visible at the forward end of the room near the ceiling. 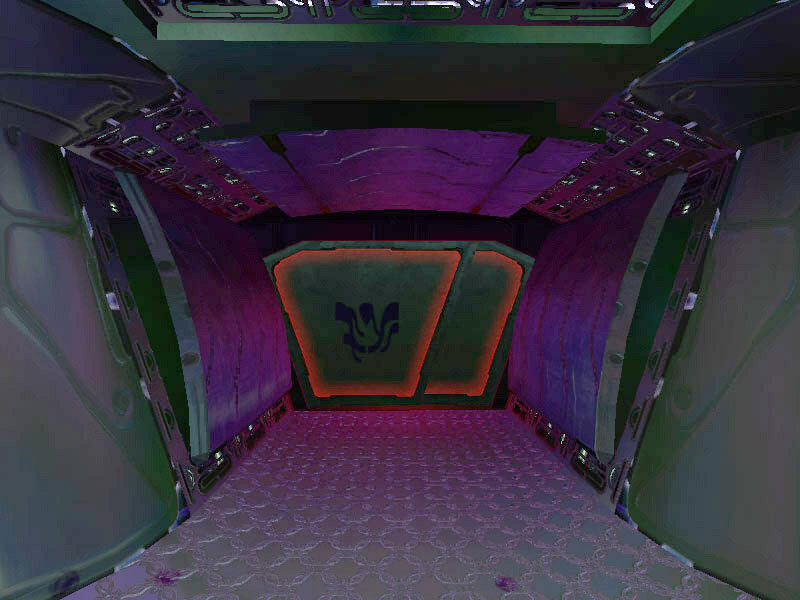 The viewscreens can either display exterior views of the ship's surroundings or can display tactical data. They can also be tied in to the security cameras on board and display ship schematics. Another area encountered by UNSC captives on board the Truth and Reconciliation are the ship's brigs. At least 2 were reconnoitered during the UNSC's rescue op, but more are likely on board. Each of the two brigs contained eight cells with four on each side. 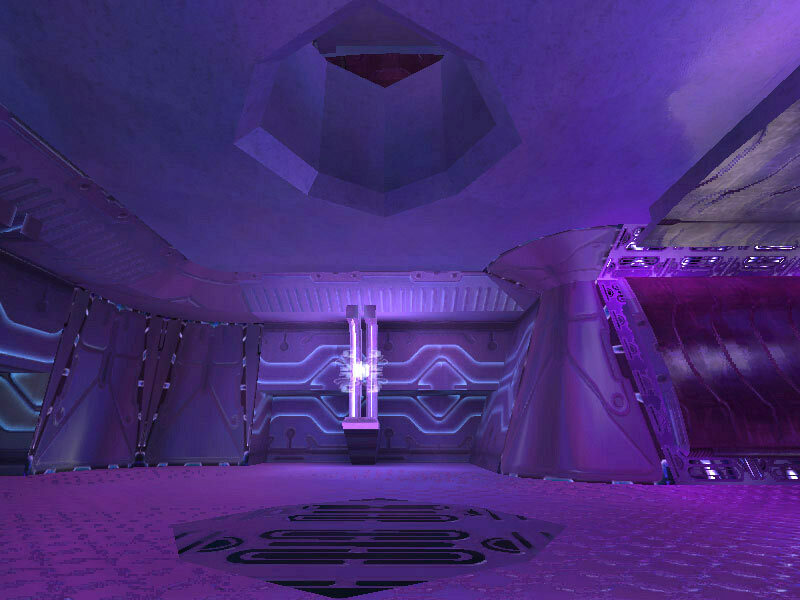 The cell's guard post and forcefield controls are at the far end of the brig, opposite the door. The brig cell barriers are similar forcefield technology to portable shield barriers on the battlefield or even the forcefields in use in the ship's shuttlebays to retain breathable atmosphere in the bays. 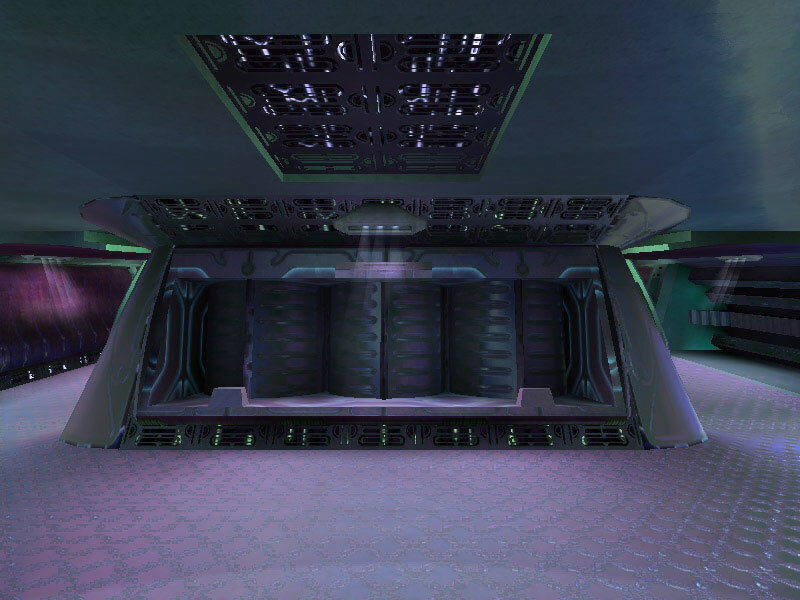 In the brigs on board the cruiser, the translucent energy fields prevented matter of any kind from penetrating them. Even plasma shots and ballistic projectiles could not pas through the fields. 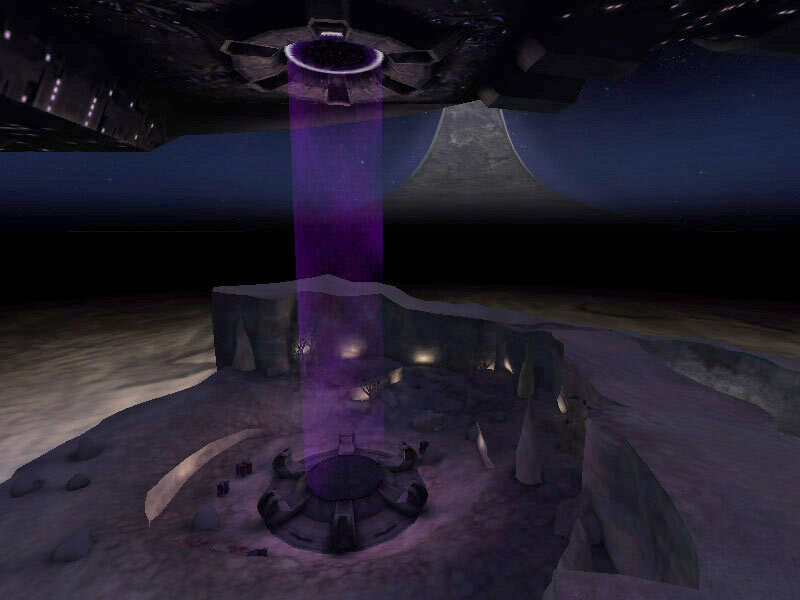 Each cell was spacious enough that each could potentially contain a dozen prisoners, but it was only observed that the Covenant placed one UNSC soldier to a cell. Captain Keyes, either by chance or design, was placed in a cell furthest from the door and nearest to the guard. 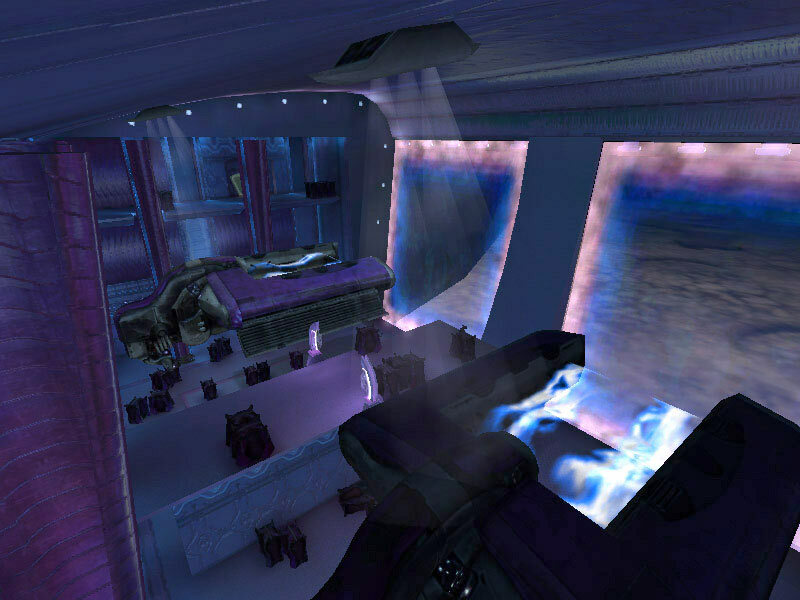 The cargo bays on board the Truth and Reconciliation were two-level expanses that contained standard Covenant gear crates and military equipment such as Wraith tanks and Ghost hoversleds. Several personnel hatches accessed the bays and a cargo hatch allowed the transfer of the vehicles from other bays on board, the gravity lift rooms, or possibly shuttlebays. 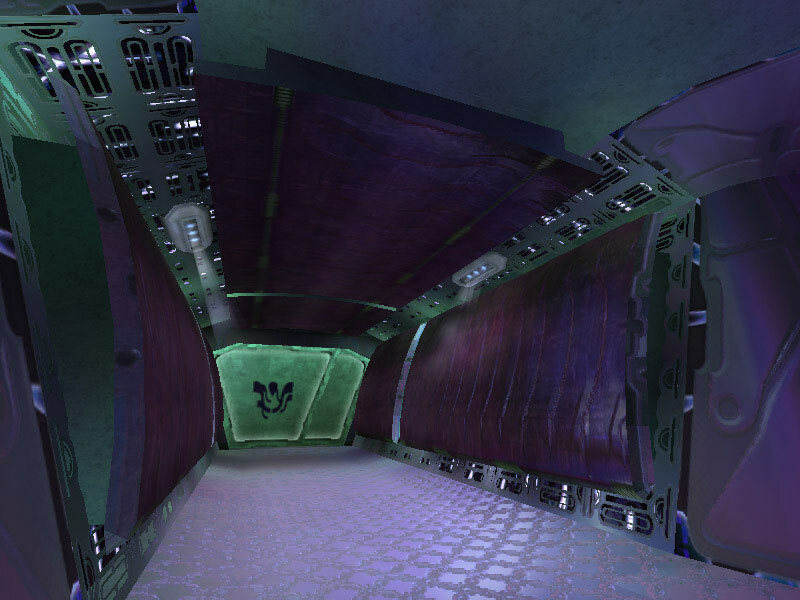 The cargo hatch was controlled by a holographic panel from the cargo bay side only. Covenant capital ships have numerous shuttlebays on board to ferry troops and materiel to other ships, orbital stations, or planetary surfaces. The CCS-class cruiser contains four bisected bays; two on the port side and two to starboard. 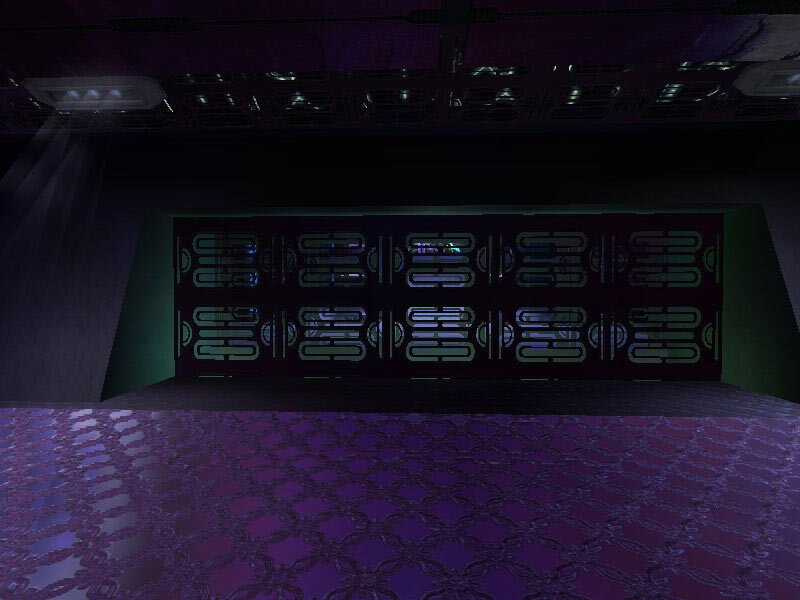 Each three-tier bay has two retracting metal doors and then the bays themselves feature forcefields over the openings to allow ships to pass through them yet can retain atmosphere and pressure inside the ship. 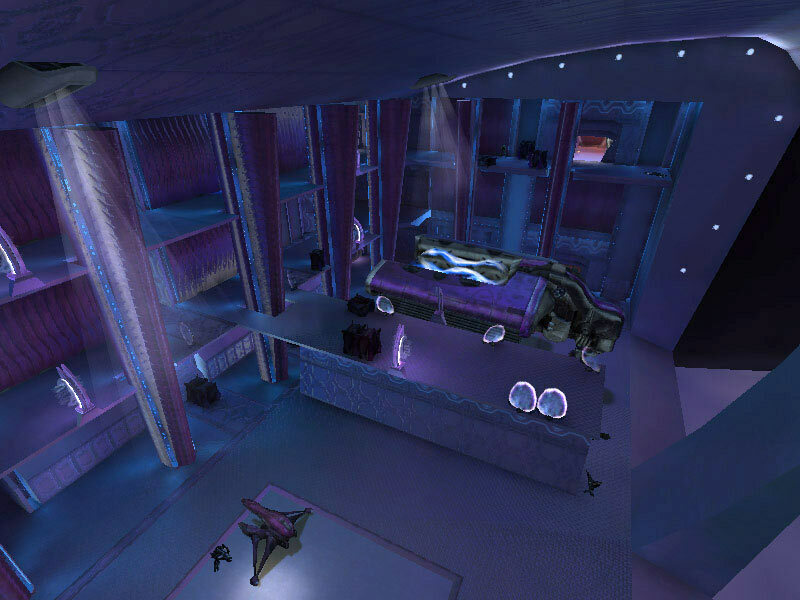 Each launch area in the bay is capable of housing a dropship, whether the traditional dropship or the newer Phantom types. Retracting elevators in the decking of each bay are used to ship Covenant ground and air craft into the bays for launching or for gravity connection to a waiting dropship. These elevators lower into holding areas adjacent to cargo bays. 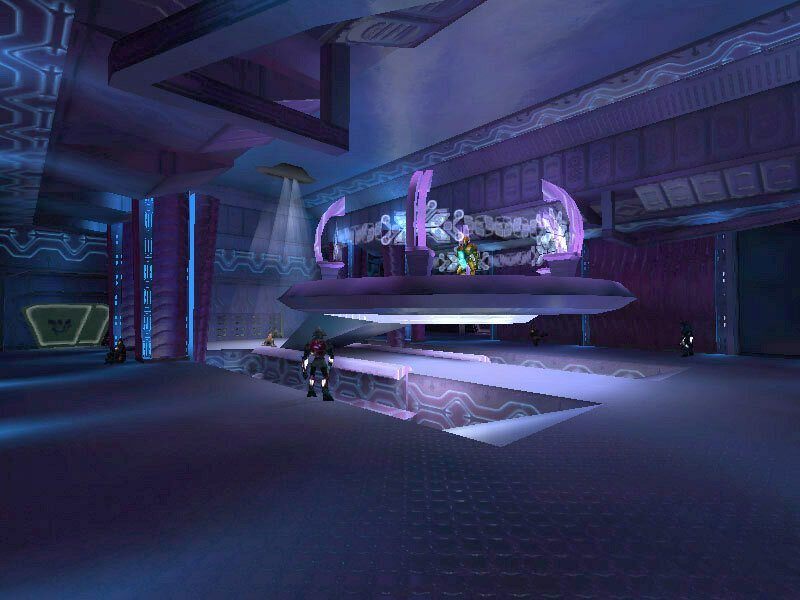 The bays are controlled by the familiar holographic controls encountered elsewhere on board the cruiser. 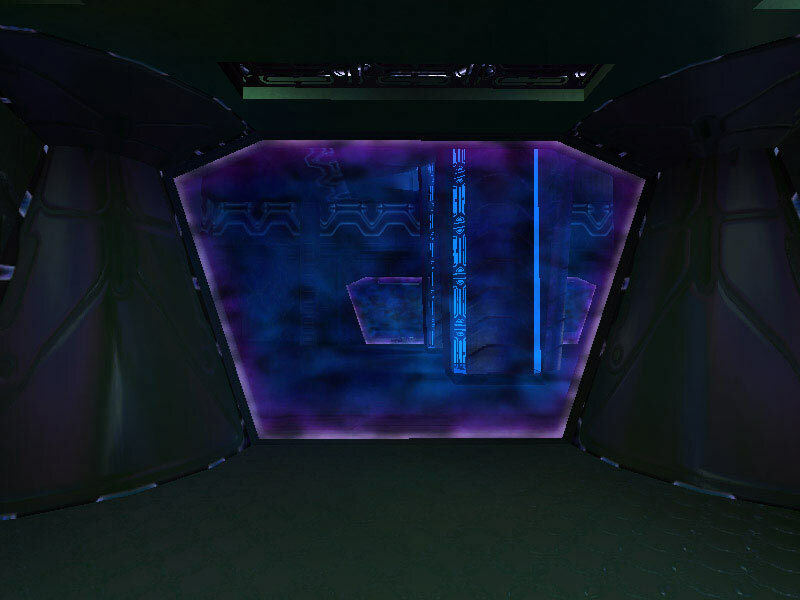 Controls for the forcefield doors are located on a second-level platform located between the bays. 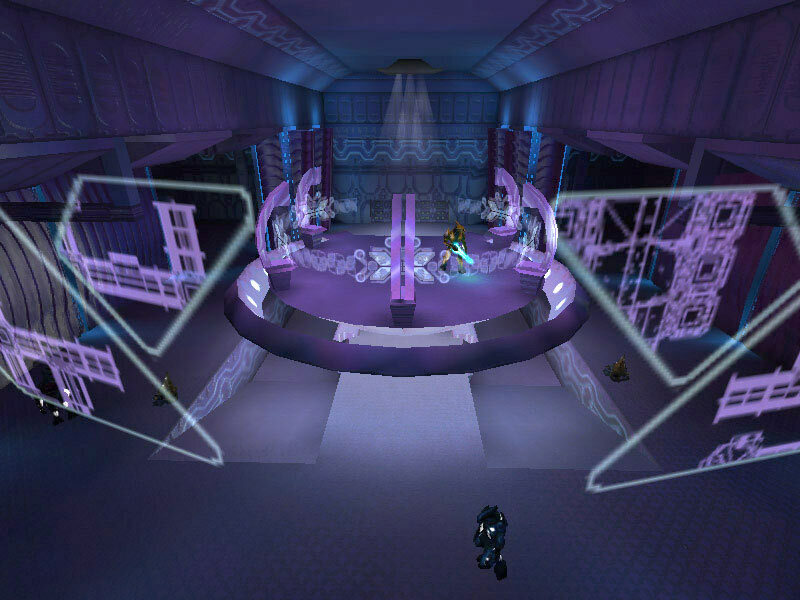 The forcefields over the entrance to the bays are projected from the top of the bays down over the door's opening by a series of energy projectors. 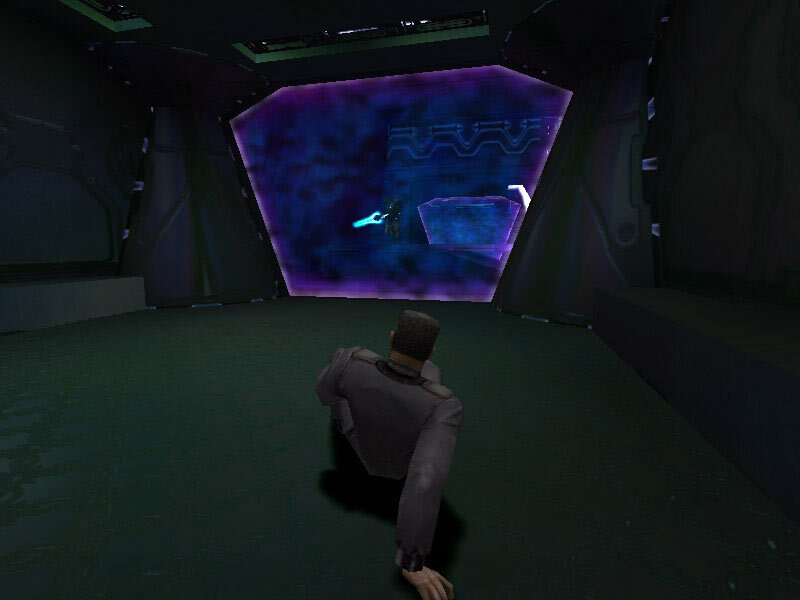 In the images below, a Covenant Engineer on the second tier of the shuttlebay is at the holographic control panel for the operation of the forcefield. 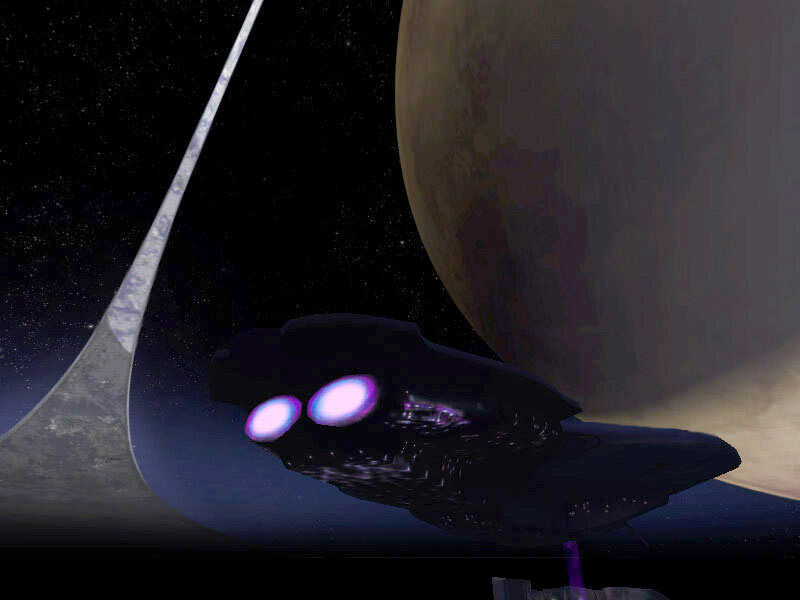 A Dropship, held in gravity locks, prepares to take a Wraith tank in tow. 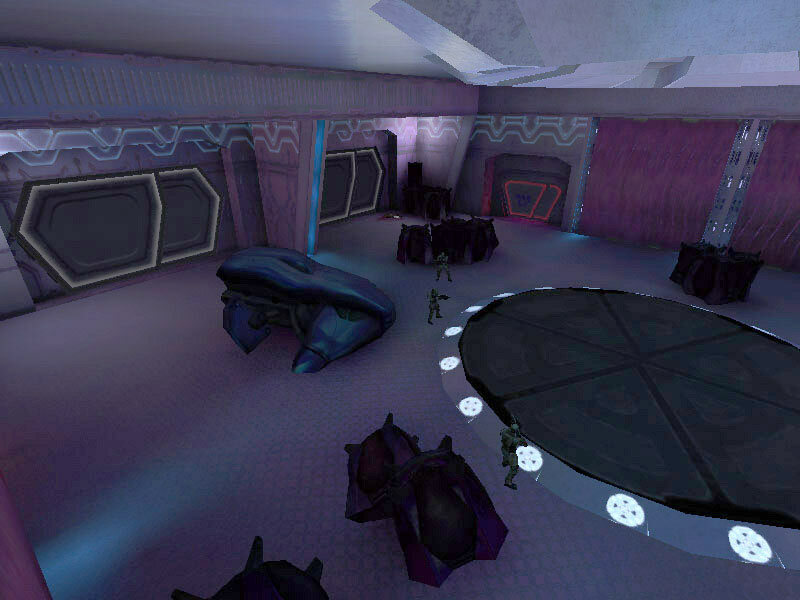 In the empty shuttlebay, the elevator platform for the Covenant's mechanized infantry is visible in the middle of the bay's deck. The shuttlebay is one of the largest single rooms on board the cruisers. 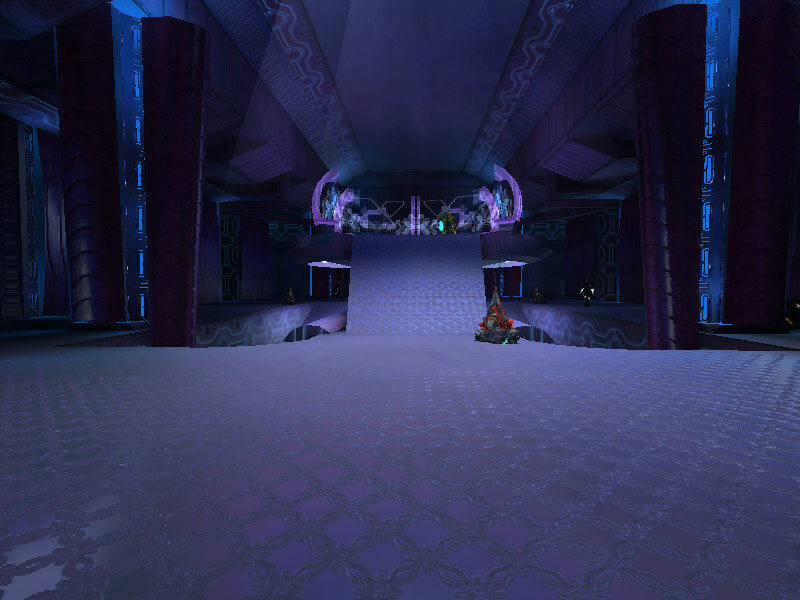 Although each bay is split into three levels, they span a height of six decks of the ship. 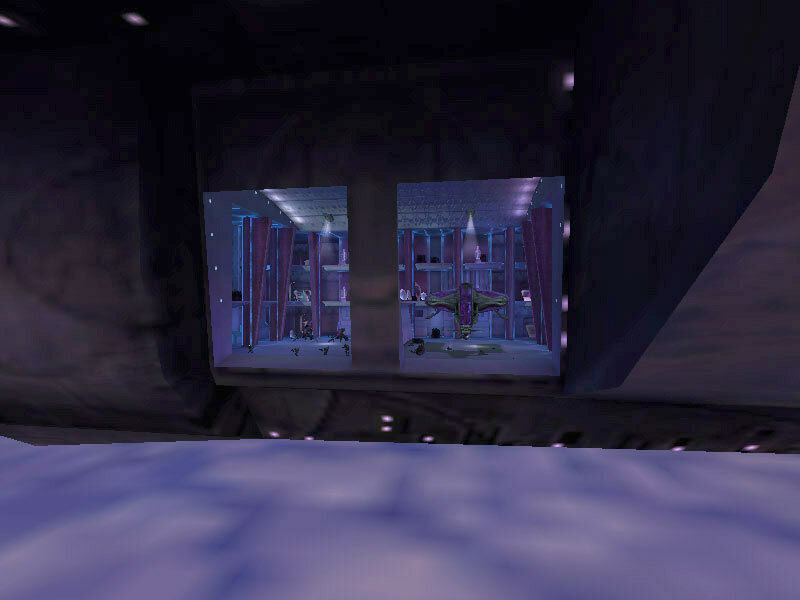 The first room on board the Truth and Reconciliation occupied by UNSC infiltrators, the gravity lift bay is similar to the cargo bays except they are only one level high. 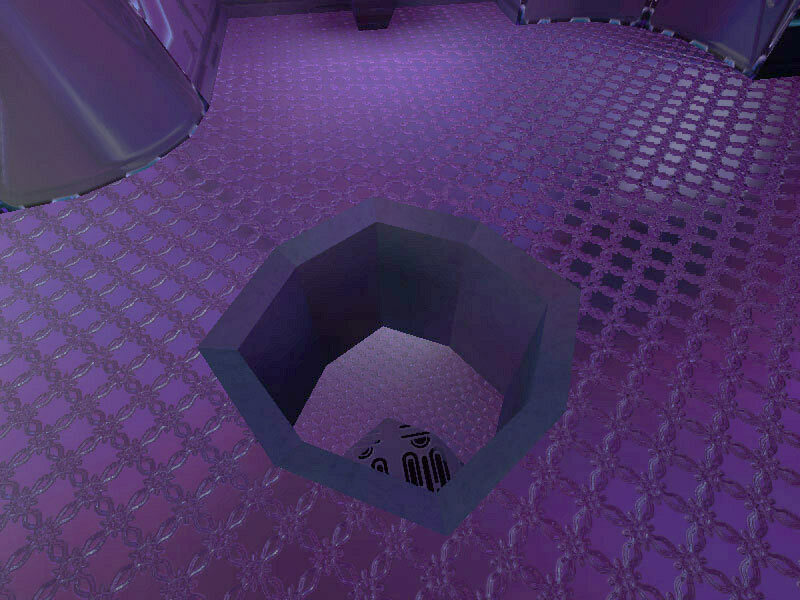 The gravity lift's materializer mechanism is situated in the center of the room, with cargo and personnel hatches located around the rectangular bay's walls. Several gravity lift bays are on board the cruisers, not far from the cargo and shuttle bays. Each grav lift bay has four cargo hatches along opposite walls for vehicle transfer. One of the most technologically interesting equipment on board Covenant capital ships is the gravity lift. 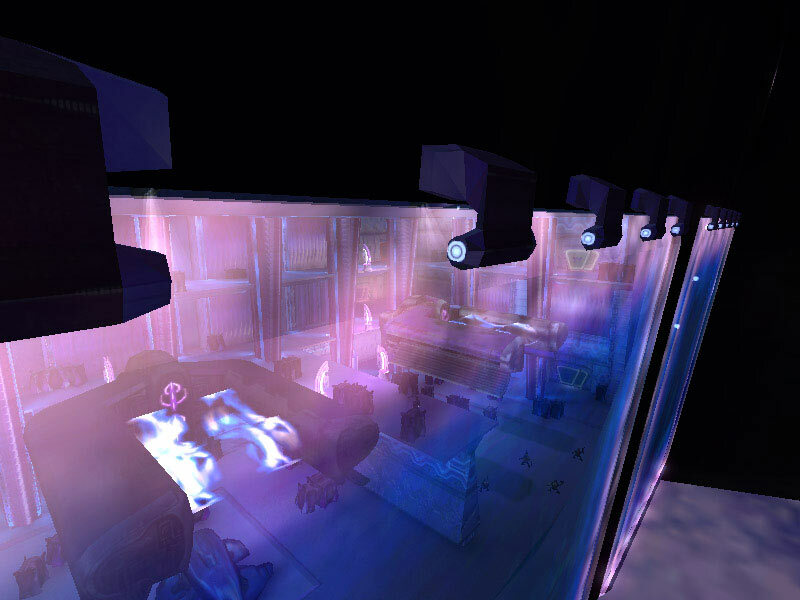 The gravity beam itself can both attract and repel objects within its influence. 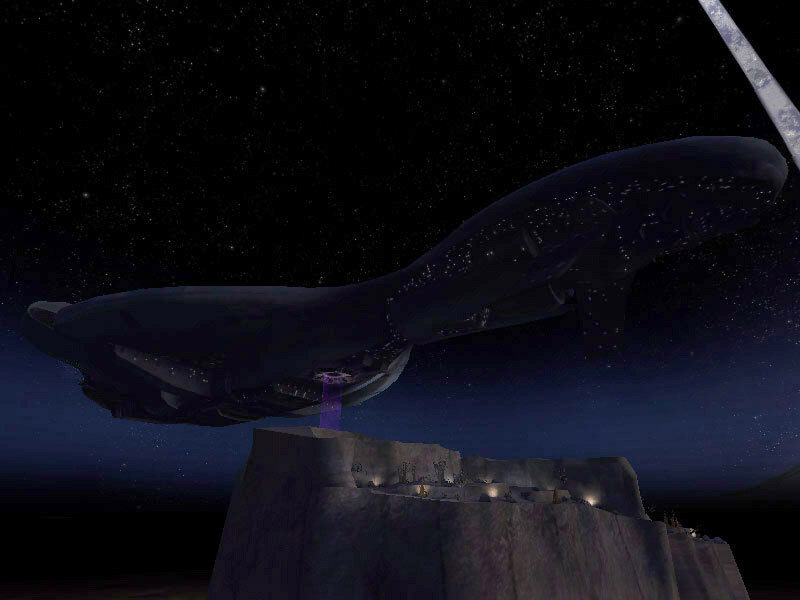 It is characterized by a purple shimmering curtain of energy surrounding the gravity lift materializer, a large round structure on the ventral surface of the cruiser along its centerline. Once an object on the surface enters the gravity beam's influence, it ascends toward the ship. 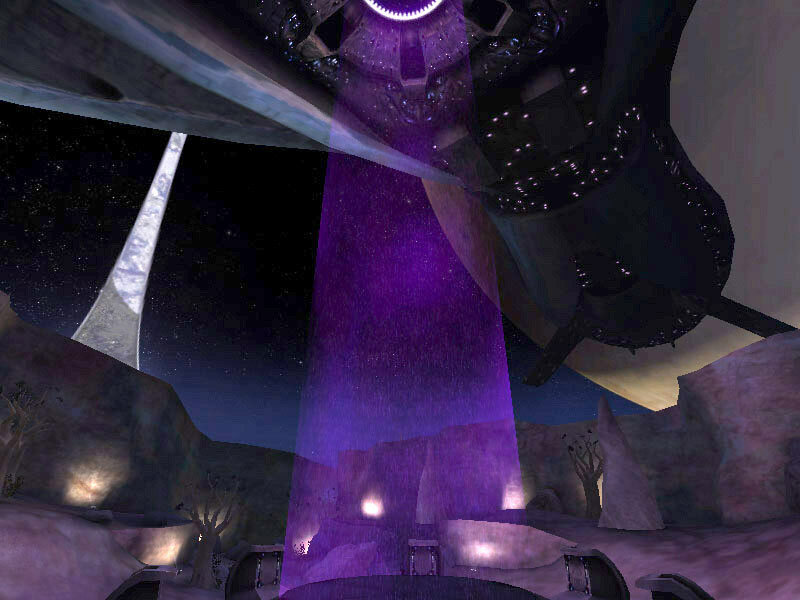 When it reaches the materializer, the object is converted to energy and is rematerialized on board the ship in one of the gravity lift bays. When surface operations are complete, the gravity beam pulls the lift platform into the air and once docked with the gravity lift again, the six clamps latch the platform in place. Because the beam itself is gravitational in nature, any weaponry fired at it will be deflected to some degree; even plasma weapons. 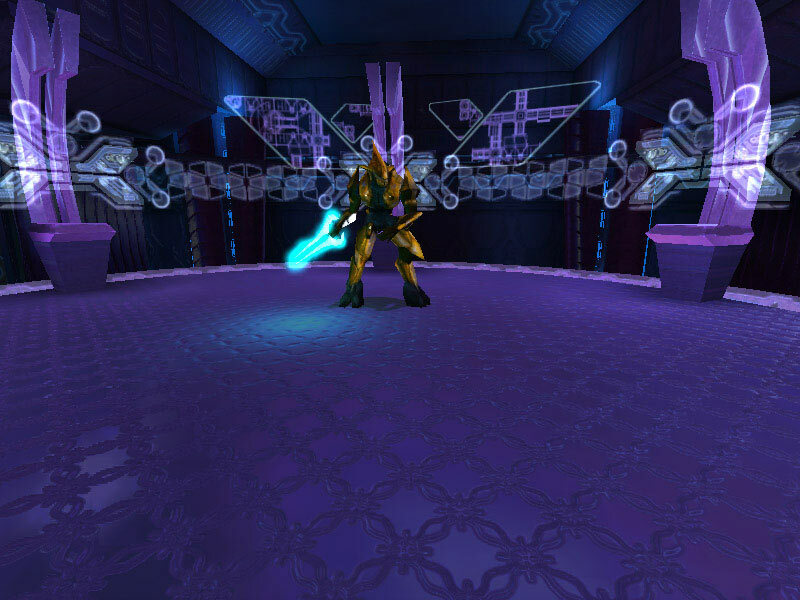 The door symbol colors are from graphics included with the game, but are unused. 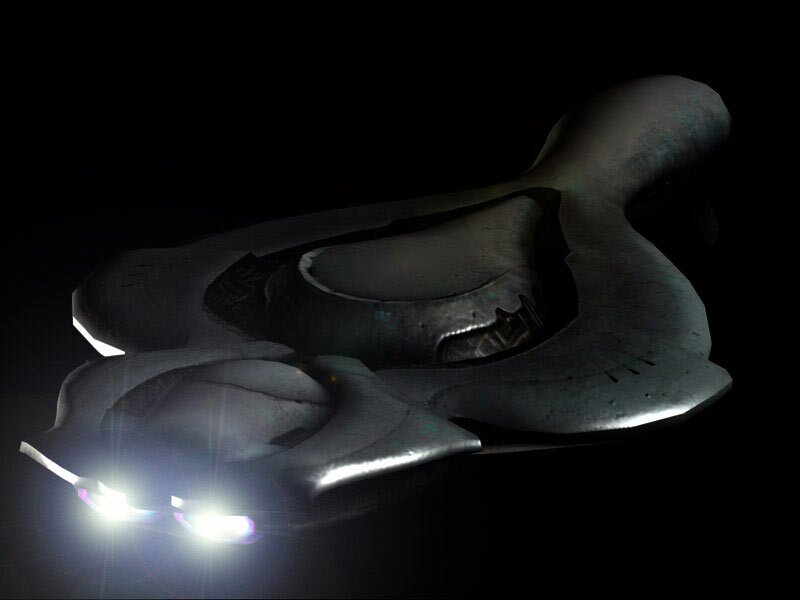 Thanks to Red Fox for help with texturing the mesh of the Covenant cruiser. All screencaps were taken with the DevTrainer and FlyCam apps running. 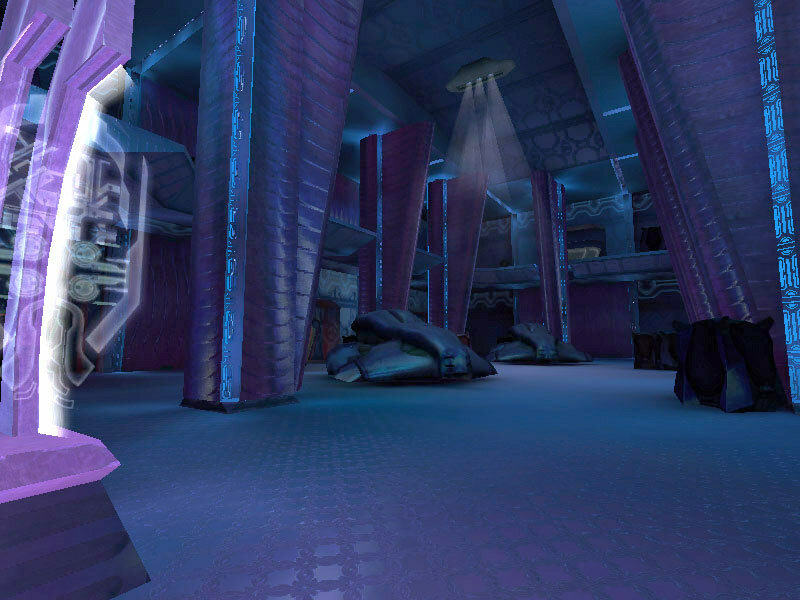 The Covenant Engineer screencap is from a Custom Edition map called HC-Hangar.